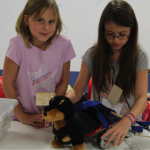 The Girls Design and Engineering Week workshop focuses on engaging girls in engineering through hands on activities emphasizing robotics, building, and making. This past summer, two workshops were held at the CEEO. The first week was comprised of a group of returning attendees that began with seed funding as a gift from Verizon in the summer of 2012.